Jim Nicholson was a veteran CIA agent and single father of three when he decided to sell secrets to the Russians for extra cash. While in jail, Jim saw the opportunity to continue his legacy and drafted his younger son, Nathan, in order to continue his association with the foreign power. Eager to please his father and trusting him implicitly, Nathan followed orders to his own detriment. I received a free copy of this non-fiction work from Audible.com in exchange for my review. [easyazon_link identifier=”B00WESENN6″ locale=”US” tag=”rabidreaders-20″]The Spy’s Son: The True Story of the Highest-Ranking CIA Officer Ever Convicted of Espionage and the Son He Trained to Spy for Russia[/easyazon_link] is an extremely well researched and thoughtfully laid out look at the genesis of a double agent and the lengths to which that agent will go to achieve goals. No relationship is sacred and no risk too great. Denson has gotten to know the Nicholson family, specifically Jim and Nathan, through primary sources that give insight into motivations adding depth to a stranger than fiction tale. [easyazon_link identifier=”B00WESENN6″ locale=”US” tag=”rabidreaders-20″]The Spy’s Son: The True Story of the Highest-Ranking CIA Officer Ever Convicted of Espionage and the Son He Trained to Spy for Russia[/easyazon_link] is a book that must be heard. Narrator Jason Culp has a fairly distinctive voice but gives a distinctive tone to each character. Jim’s voice is slightly singsong and layered with manipulative edge. Culp gives Nathan’s voice a naivety. Listeners will picture the narrator with wide eyes and an innocent countenance. A scene that truly highlights the skill of this narrator is a conversation between Nathan and his sister, Star. He gives Star a lightly feminine and incredulous but loving voice. When listening I didn’t picture a man in front of a microphone but a brother and sister in a coffee shop talking about life’s mistakes. 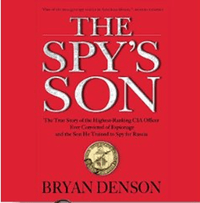 At 12 hours and 51 minutes (368 pages), [easyazon_link identifier=”B00WESENN6″ locale=”US” tag=”rabidreaders-20″]The Spy’s Son: The True Story of the Highest-Ranking CIA Officer Ever Convicted of Espionage and the Son He Trained to Spy for Russia[/easyazon_link] is a book loaded with detail. Denson first outlines Jim’s start with the CIA, establishing his tendency for control and skill for manipulation. The final 1/3 of the novel deals with Nathan’s entry into the spy game and Jim’s grooming of his son for the task. Denson paints Nathan as a man with a soft heart who was easily led by using his love for his father. Don’t get me wrong, Nathan liked the money but his primary concern seems to be for his family and the ultimate benefit to them. Comfort for Nathan came with his innocence in the situation. When the true manipulation become apparent, would he accept knowledge of that betrayal? I found Denson’s writing style to be interesting and engaging. Any questions readers have, Denson answers. There are no stones left unturned. With the aforementioned intimate knowledge of the subjects, Denson is able to tell a story as much as relate fact. We have a good idea of the conversation passing between Jim and Nathan and what might have been said to a girlfriend or sibling. I listened to most of the book while on a family driving trip. Having forgotten headphones, Mr. Rabid Reader was able to share the experience. Mr. Rabid Reader found the work boring and too detail heavy. Though he holds a degree in English Literature, the husband is not a man who reads. “Who cares how much he spent for a notebook?” Mr. RR asked me, “Why do we need to know that?” Had he been interested in the subject, he may have found the book more interesting. Denson does for me what I love in books about criminals, he explains the “why” in great detail and that attention to detail is clearly not for everyone. If you’re interested in criminal psychology, spy fiction or generally stories of dysfunctional families, [easyazon_link identifier=”B00WESENN6″ locale=”US” tag=”rabidreaders-20″]The Spy’s Son: The True Story of the Highest-Ranking CIA Officer Ever Convicted of Espionage and the Son He Trained to Spy for Russia[/easyazon_link] is the story for you. Give it a shot in audio book format. You will not be disappointed. Listen to the first minutes and buy The Spy’s Son by Bryan Denson on Audible. Bryan Denson is investigative reporter and Pulitzer Prize finalist. For more information about him and his work, visit his profile and contributions on the Oregonlive website. You can connect with him on Goodreads, Facebook Google+ and Twitter @Bryan_Denson.